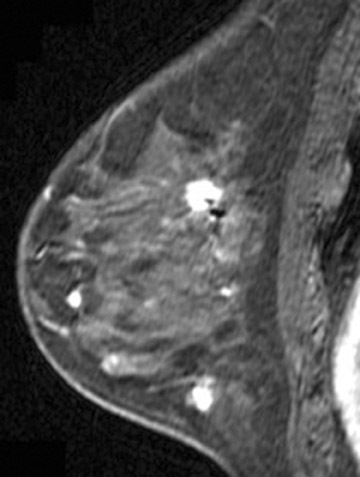 The following clinical scenarios, for which breast MRI is indicated, will be reviewed: Preoperative evaluation of patients with newly diagnosed breast cancer, evaluation of breast cancer patients treated with neoadjuvant chemotherapy, evaluation of breast cancer patients with positive surgical margins following breast conservation therapy, evaluation of patients with metastatic axillary lymphadenopathy and an unknown primary malignancy, determination of silicone breast implant integrity, breast cancer screening in high risk women, and the use of breast MRI as a problem-solving tool for equivocal mammographic findings. 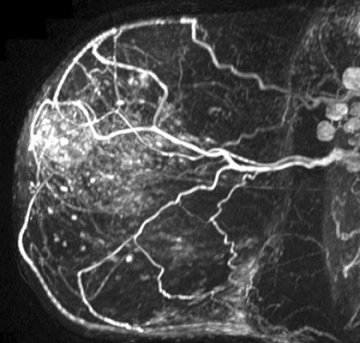 Tumor size is also more accurately depicted with MRI vs.mammography when correlated with pathologic specimens.8,9 Occult, synchronous, contralateral breast cancer is also identified in approximately 3% of patients.10 Although long-term information is not yet available, the intended and potential benefits of using breast MRI in these patients include: Decreasing the number of surgeries required to obtain negative surgical margins, decreasing breast cancer recurrence rates, and improving long-term survival. 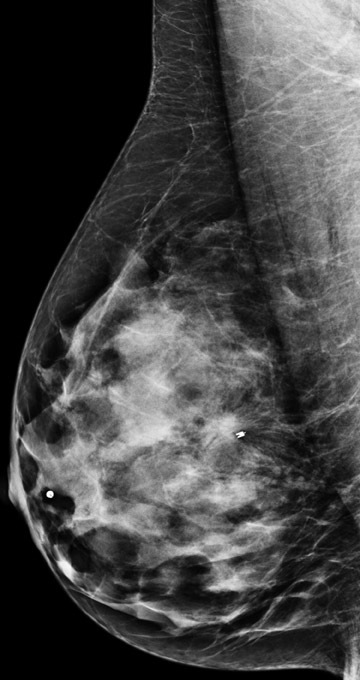 Figure 1 demonstrates an example of a patient who was newly diagnosed with invasive ductal carcinoma after a mass was initially identified on screening mammography. 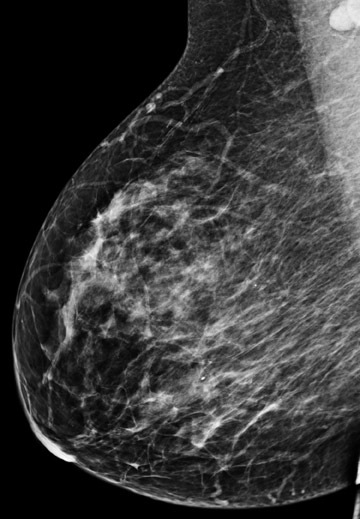 Mammography and ultrasound identified one suspicious mass. Preoperative MRI identified 4 additional suspicious masses. 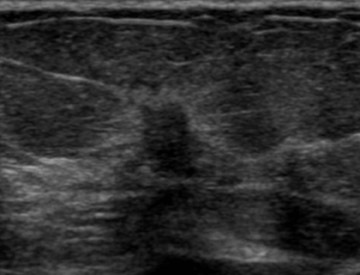 Ultrasound-guided biopsy was performed for a mass in the inferior breast that resulted in a diagnosis of multicentric malignancy requiring mastectomy. While there is no definitive evidence at this time that MRI is more appropriate for certain subgroups of patients with newly diagnosed breast cancer, there is evidence to suggest that breast MRI may be particularly helpful in certain situations. This includes patients who have dense breast tissue, invasive lobular carcinoma, extensive ductal carcinoma in-situ (DCIS) and those who will be treated with neoadjuvant chemotherapy. Invasive lobular carcinoma is generally believed to have an increased propensity for bilateral disease. Lehman et al. 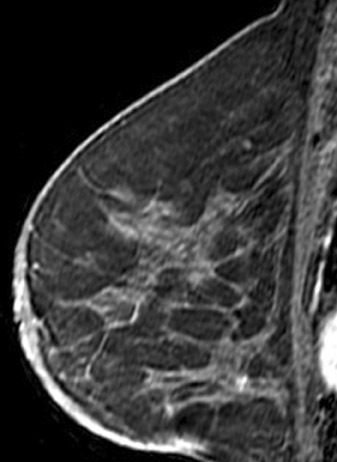 identified otherwise occult tumor in the contralateral breast in 6% of patients with newly diagnosed invasive lobular carcinoma vs.3% in patients with invasive ductal carcinoma.10 The infiltrative growth pattern, and the tendency for mammography and ultrasound to underestimate the tumor size of invasive lobular carcinoma, may explain the increased rate of positive surgical margins at breast conservation treatment. Dillon et al. 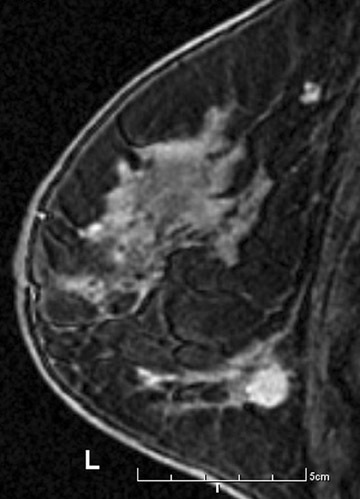 reported that positive surgical margins occurred in approximately 50% of patients who were diagnosed with invasive lobular carcinoma and did not undergo preoperative MRI vs. 25% of patients who were diagnosed with invasive ductal carcinoma.16 Figure 2 illustrates an example of newly diagnosed invasive lobular carcinoma that was found by MRI to be much larger than expected on mammography and ultrasound. Tumors located posteriorly in the breast are difficult to evaluate fully with mammography and muscle invasion is often difficult to detect by ultrasound due to acoustic shadowing from the tumor. MRI can be helpful in detecting tumor invasion of the pectoral muscle and chest wall. Tumor invasion is identified as muscle enhancement, which may have an infiltrative or mass-like appearance. Muscle enhancement is the only finding which has been shown to reliably indicate tumor invasion. 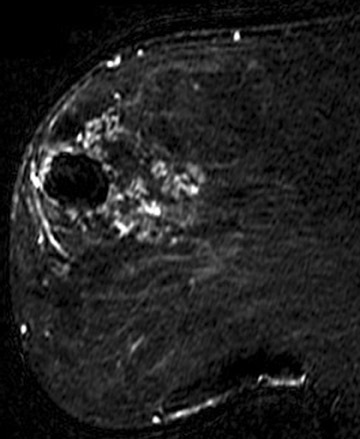 Loss of fat planes between the tumor mass and muscle, and vascular structures extending from the tumor through the muscle, do not indicate tumor invasion.17 Figure 3 illustrates a case of ultrasound-guided biopsy-proven breast cancer recurrence with deep pectoral muscle invasion, identified by MRI. Unsuspected multicentric disease was also identified. 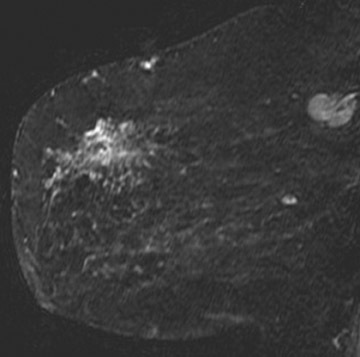 Breast MRI is helpful in demonstrating the true tumor size initially, as well as identifying residual tumor following the completion of neoadjuvant therapy. Although, MRI is limited by both over- and underestimation of residual disease, it has been shown to correlate more accurately with pathologic specimens, in the range of 71% to 90%, vs. clinical exam (19% to 60% accuracy), ultrasound (35% to 75% accuracy) and mammography (26% to 70% accuracy).19-23 It is important to recognize that even though no residual disease maybe evident by MRI, surgical resection is still required due to the potential under estimation of residual disease. For this reason, it is important to place a tissue marker prior to treatment. Figure 4 demonstrates a patient who had a good response, with only a small amount of enhancement remaining at the tumor site following neoadjuvant chemotherapy. Recent studies have identified that factors such as tumor biology and antiangiogenic chemotherapeutic agents may decrease the accuracy of MRI.23 Additional research is needed to identify the patients who are most appropriate for MRI in this setting. MRI has shown promise as a potential method for monitoring early responses during the course of neoadjuvant therapy. The ACRI maging Network (ACRIN) is currently sponsoring a multi-institutional prospective clinical trial (ACRIN 6657) to assess the role of MRI in neoadjuvant treatments. This study is nearing complete accrual with results anticipated soon. Additional patients are also being enrolled to evaluate the role of MR spectroscopy following one cycle of chemotherapy, which was added to the protocol in 2007. Patients who have been treated with breast conservation therapy with resultant positive surgical margins are typically offered one additional attempt at excision. Mastectomy is usually performed if negative margins are not achieved. Breast MRI in these patients is helpful to identify the extent of residual disease, which may aid in surgical planning for re-excision and may prospectively identify those patients who would ultimately require mastectomy. The purpose of MRI is to detect the presence of multifocal and multicentric disease as well as to detect bulky residual disease at the lumpectomy site in order to allow directed re-excision. Microscopic residual disease at the surgical margins is known to be present and surgical excision is still required, even if the MRI findings are negative. The evaluation of the tumor bed with MRI is limited, as granulation tissue may enhance in the early postoperative period. Frei et al. determined that the least number of false-positive results were found when MRI was performed between 35 to 42 days following surgery.24 In general, sensitivities ranging from 61% to 86% for detecting residual disease have been reported.24-26 Figure 5 demonstrates the case of a patient who was diagnosed with invasive ductal carcinoma and DCIS by ultrasound-guided biopsy of a breast mass. Surgical excision was then performed and DCIS was present at the surgical margins. Subsequent breast MRI demonstrated a large area of segmental ductal enhancement that was suspicious for DCIS. MRI-guided biopsy was offered, but the patient chose to have a mastectomy, which confirmed extensive DCIS. Patients presenting with metastatic axillary adenocarcinoma with no evidence of breast cancer on physical exam or mammography represent <1% of all breast carcinoma cases. Only a few studies, consisting of a limited number of patients, have analyzed this topic. These studies report the identification of occult primary breast cancer by MRI in 62% to 86% of patients.27,28 Often the primary tumors identified are <2 cm.27 The importance of identifying a primary malignancy is two fold. It may allow the patient the option of breast conservation therapy rather than mastectomy, which is typically performed when the primary tumor is not identified. Also, targeted hormonal and chemotherapeutic treatments may be offered when histology from the primary tumor can be obtained. Breast MRI is strongly indicated for these patients. A large number of American women have silicone breast implants. Unlike saline implant rupture, which is readily apparent on physical exam, silicone implant rupture can be difficult to identify. MRI is the imaging modality of choice for detecting silicone implant rupture. It has been shown to be superior to mammography and ultrasound with the sensitivity of MRI reported to range from 78% to 100% and specificity ranging from 63% to 91%.29-32 Noncontrast, silicone hyperintense, inversion recovery sequences are used. Intracapsular implant rupture occurs when the implant envelope degrades but the silicone remains contained within a surrounding fibrous capsule formed by the body. 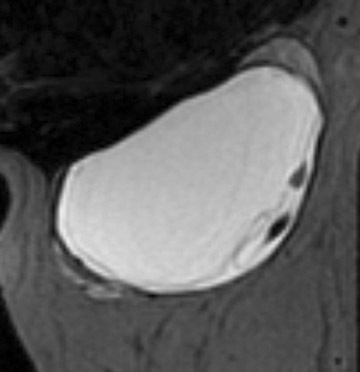 The collapsed implant envelope is seen on MRI as the linguine and keyhole signs. Extracapsular rupture results in free silicone outside of the fibrous capsule within the breast or axilla. Figure 6 illustrates an example of both intracapsular and extracapsular implant rupture. Screening mammography is the only imaging modality that has been proven to decrease breast cancer mortality for the general population. 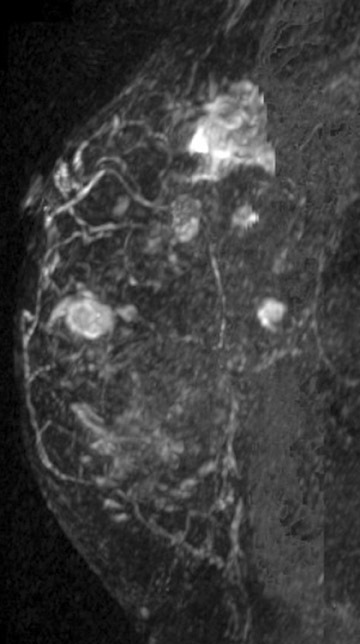 Breast MRI has been shown to detect an increased rate of small node-negative cancers in women at high risk for breast cancer and it is a useful screening tool when used as an adjunct to mammography in high-risk women.30 However, due to its limited specificity and high cost, MRI is not appropriate for screening the general population. patients with a lifetime risk for breast cancer of >20% to 25% as determined by risk models. patients with a personal history of breast cancer. 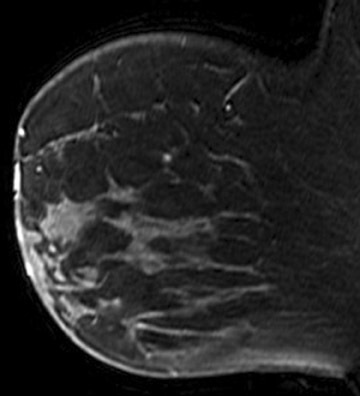 The use of breast MRI as a problem-solving tool for equivocal mammographic findings is controversial. This falls under the category of lesion characterization, which is included in the ACR practice guidelines. MRI should not be performed in lieu of a thorough conventional imaging workup or to obviate biopsy of suspicious mammographic, sonographic or palpable findings. However, in a recent study of 115 patients, MRI was performed for the purpose of evaluating equivocal mammographic findings, following a full diagnostic workup. This study found 100% sensitivity and 92% specificity of MRI in this setting.35 MRI was also found to be helpful by allowing 3-dimensional localization of abnormalities that were only seen on one mammographic view, allowing confident biopsy targeting. These authors also indicated that negative MRI findings may allow increased confidence in performing short-term mammographic follow-up rather than stereotactic biopsy for one-view equivocal findings. 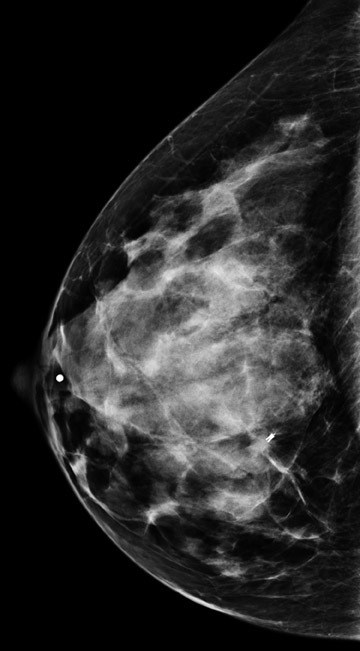 Figure 7 demonstrates a case of a baseline mammogram with an asymmetry seen only on the MLO view. The finding persists on a spot compression MLO view and a full mediolateral view. However, a corresponding abnormality was not present on the CC view. Given that there were parenchymal densities that could obscure a finding in the lateral breast, ultrasound of the upper outer breast was also performed, which was normal. An area of breast parenchyma with similar shape and no suspicious enhancement was seen in this location on MRI. Short term mammographic follow-up was recommended. 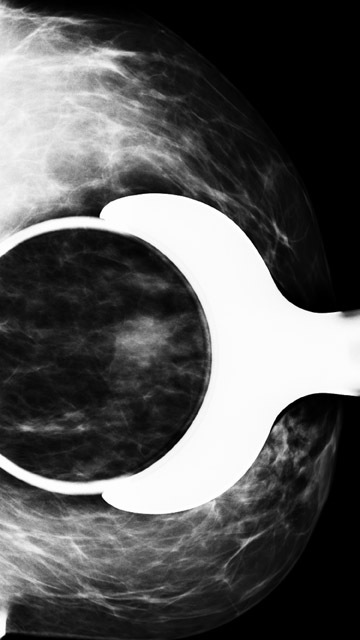 Breast MRI is a valuable imaging tool in addition to mammography and ultrasound, which allows the identification of otherwise occult breast disease. It is particularly useful in the evaluation of patients with breast cancer and for screening women at high risk of breast cancer. 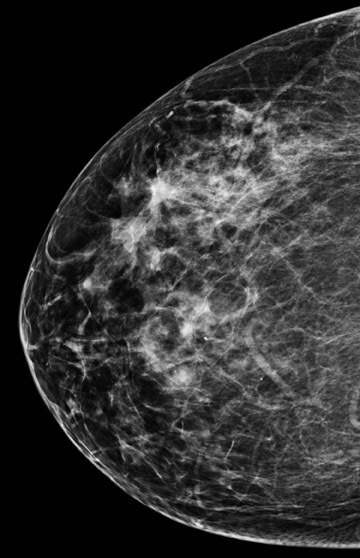 The indications for the performance of breast MRI outlined in the ACR practice guidelines have been reviewed. Due to its high cost and limited specificity, it is imperative that breast MRI be used judiciously in accordance with these guidelines. American College of Radiology Practice Guidelines for the Performance of Magnetic Resonance Imaging of the Breast. Available at:http:// www.acr.org. Accessed onSeptember 13, 2010. Berg WA, Gutierrez L, Ness Aiver MS, et al. Diagnostic accuracy of mammography, clinical examination, US, and MR imaging in preoperative assessment of breast cancer.Radiology. 2004;233:830-849. Bedrosian I, Mick R, Orel SG, et al. Changes in the surgical management of patients with breast carcinoma based on preoperative magnetic resonance imaging. Cancer.2003;98:468-473. Liberman L, Morris EA, Dershaw DD, et al. 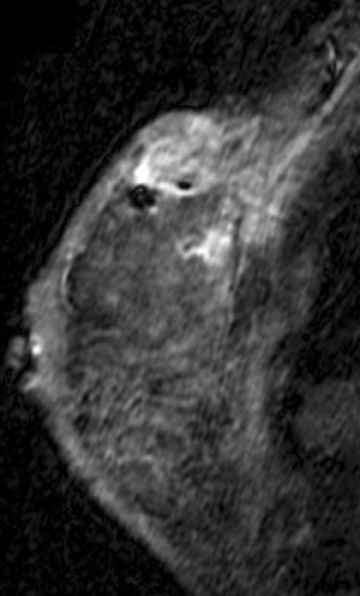 MR imaging of the ipsilateral breast in women with percutaneously proven breast cancer. AJR Am J Roentgenol. 2003;180:901-910. Schelfout K, Van Goethem M, Kersschot E, et al. 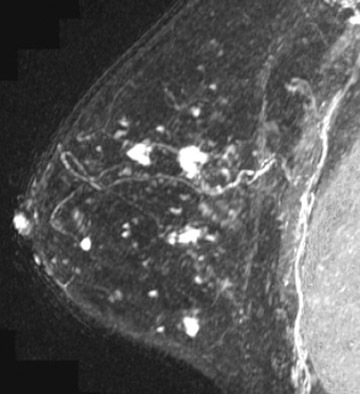 Contrast-enhanced MRI imaging of breast lesions and effect on treatment. Eur J Surg Oncol.2004;30:501-507. VanGoethem M, Schelfout K, Kersschot E, et al. Enhancing area surrounding breast carcinoma on MR mammography: Comparison with pathological examination. Eur Radiol. 2004;14:1363-1370. Boetes C, Mus RD, Holland R, et al. Breast tumors: Comparative accuracy of MR imaging relative to mammography and US for demonstrating extent. Radiology. 1995;197:743. Lehman CD, Gatsonis C, Kuhl CK, et al. 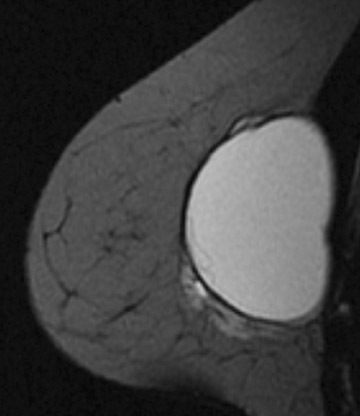 MRI evaluation of the contralateral breast in women with recently diagnosed breast cancer. N Engl J Med. 2007; 356:1295-1303. Berg WA: Imaging the local extent of disease. Semin Breast Dis. 2001;4:153-173. Hwang ES, Kinkel K, Esserman LI, et al. Magnetic resonance imaging in patients diagnosed with ductal carcinoma-in-situ: Value in the diagnosis of residual disease, occultinvasion and multicentricity. Ann Surg Oncol. 2003;10:381-388. Kreche KN, Gisvold JJ. Invasive lobular carcinoma of the breast: Mammographic findings and extent of disease at diagnosis in 184 patients. AJR Am J Roentgenol.1993;161:957-960. Mann RM, Hoogeveeri YL, Blickman JG, Boetes C.MRI compared to conventional diagnostic work-up in the detection and evaluation of invasive lobular carcinoma of thebreast: A review of existing literature. Breast Cancer Res Treat. 2008; 107:1-14. Rodenko GN, Harris SE, Prurieda JM, et al. MR imaging in the management before surgery of lobular carcinoma of the breast: Correlation with pathology. AJR Am J Roentgenol. 1996; 167:1415-1419. Dillon MF, Hill AD, Fleming FJ, et al. Identifying patients at risk of compromised margins following breast conservation for lobular carcinoma. Am J Surg. 2006;191:201-205. Morris EA, Schwartz LH, Drotman MB, et al. Evaluation of pectoralis major muscle in patients with posterior breast tumors on breast MR images: Early experience.Radiology. 2000;214:67-72. Kaufmann M, Von Minckwitz G, Smith R, et al. International expert panel on the use of primary (preoperative) systemic treatment of operable breast cancer: Review andrecommendations. J Clin Oncol. 2003;21:2600-2608. Yeh E, Slanetz P, Kopans D, et al. Prospective comparison of mammography, sonography and MRI in patients undergoing neoadjuvant chemo-therapy for palpable breastcancer. AJR Am J Roentgenol. 2005:184;868-877. Partridge S, Gibbs J, Yin L, et al. Accuracy of MR imaging for revealing residual breast cancer in patients who have undergone neoadjuvant chemotherapy. AJR Am J Roentgenol. 2002;179: 1193-1199. Belli P, Consantini M, Malaspina C, et al. MRI accuracy in residual disease evaluation in breast cancer patients treated with neoadjuvant chemotherapy. Clin Rad.2006;61:946-953. Chagpar AB, Middleton LP, Sahin AA, et al. Accuracy of physical examination, ultrasonography, and mammography in predicting residual pathologic tumor size in patientstreated with neoadjuvant chemotherapy. Ann Surg. 2006;243: 257-264. Chen JH, Feig B, Agrawal G, et al. MRI Evaluation of pathologically complete response and residual tumors in breast cancer after neoadjuvant chemotherapy. Cancer.2008;112:17-26. Frei KA, Kinkel K, Bonel HM, et al. MR imaging of the breast in patients with positive margins after lumpectomy:Iinfluence of the time interval between lumpectomy and MRimaging. AJR Am J Roentgenol. 2000;175:1577-1584. Orel SG, Reynolds C, Schnall MD, et al. Breast carcinoma MR imaging before re-excisional biopsy.Radiology. 1997:205;429-439. Lee JM, Orel SG, Czerniecki BJ, et al. MRI before re-excision surgery in patients with breast cancer. AJR Am J Roentgenol. 2004;182:473-480. Orel SG, Weinstein SP, Schnall MD, et al. Breast MR imaging in patients with axillary node metastases and unknown primary malignancy.Radiology. 1999;212:543-549. Buchanan CL, Morris EA, Doru PL, et al. Utility of breast magnetic resonance imaging in patients with occult primary breast cancer. Amer Surg Oncol. 2005;12:1045-1053. Goodman CM, Cohen V,Thornby J, Netscher D. The life span of silicone gel breast implants and a comparison of mammography, ultrasound, and magnetic resonance imaging indetecting implant rupture: A meta-analysis. Ann Plast Surg. 1998;41:577-586. Giovanni DB, Cecchini S, Grassetti L, et al. Comparative study of breast implant rupture using mammography, sonography and magnetic resonance imaging: Correlationwith surgical findings. Breast J. 2008;14:532-537. Ikeda DM, Borofsky HB, Gerfkens RJ, et al. Silicone breast implant rupture: Pitfalls of magnetic resonance imaging and relative efficacies of magnetic resonance, mammography and ultrasound. Plast Reconstr Surg. 1999;104:2054-2062. Cher DJ, Conwell JA, Mandel JS. MRI for detecting silicone breast implant rupture: Meta-analysis and implications. Ann Plast Surg. 2001;47:367-380. Kriege M, Brekelmans CT, Boetes C, et al.Efficiency of MRI and mammography for breast cancer screening in women with a familial or genetic predisposition. N Engl J Med. 2004;351:427-437. Bluemke D, Gatsonis C, Chen M, et al. Magnetic resonance imaging of the breast prior to biopsy.JAMA. 2004;292:2735-2742. Moy L, Elias K, Patel V, et al. 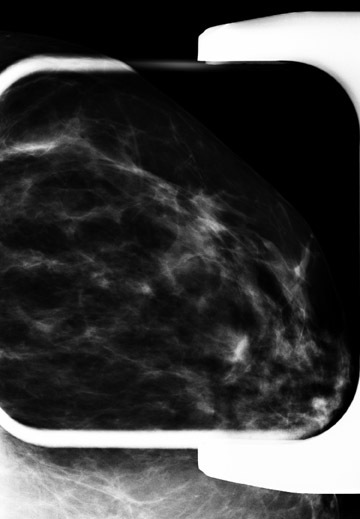 Is breast MRI helpful in the evaluation of inconclusive mammographic findings?AJR Am J Roentgenol. 2009; 193:986-993. Clinical indications for breast MRI. Appl Radiol.